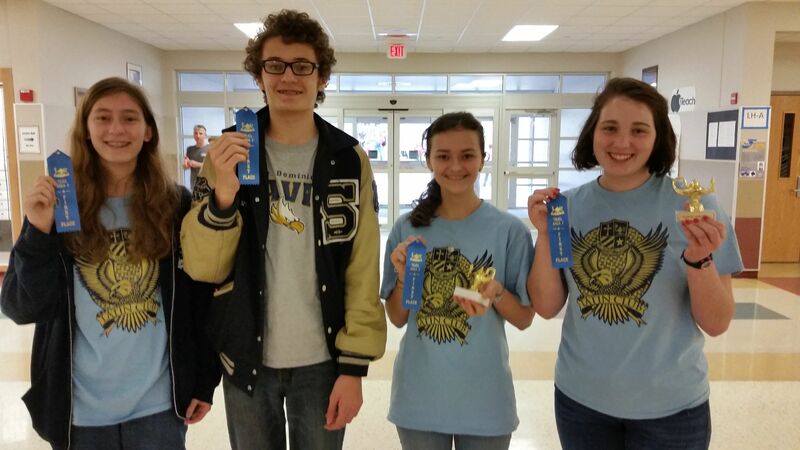 Savio Quiz Bowl Catches Fire in February! February was a big month for the Eagle Quiz Bowlers. 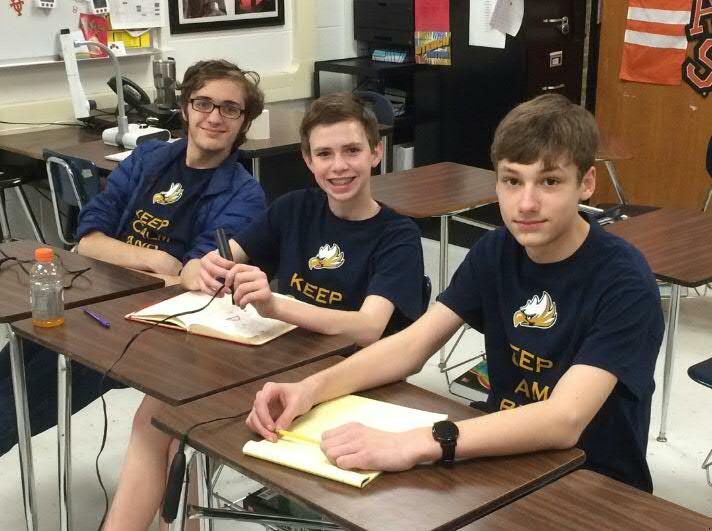 On the weekend of February 13th the all-freshman team of Nicholas Bianchi, Nicholas Huth, Matthew Meskill and Jonathan Shoemaker competed in the Heart of Texas Quiz Bowl tournament in Temple, TX. Facing off against teams mostly full of juniors and seniors the Eagle freshmen made a perfect run thru the preliminary rounds, going 8-0. The Eagles won these matches by an average score of 378-110. They had a scare in the semi-final round of the playoffs in a matchup against Temple High School. Neither team was able to get the final toss-up and the Savio squad held on to win by a score of 310-290. But in the finals the Eagles never looked back, racing to a 340-175 championship victory against the B team from Belton High School. Jonathan and Matthew were the two top two scorers in the tournament. Jonathan scored 66 points per game (13 powers and 7 NEG5's) and Matthew scored 56.5 points per game (15 powers and 6 NEG5's). Next on the schedule was the Gipper Games at Reagan High School in San Antonio on February 27th. The three player team of Nicholas Huth, Matthew Meskill and Bryn Stryk competed in the JV division of the tournament. The young Eagle squad seemed a little bit sleepy in the first match of the day, managing to just tie the Brandeis JV team 220-220. But they woke up after that and rattled off an impressive string of six consecutive victories by an average score of 261-87. The 6-0-1 record gave Savio the number one seed for the playoff round. Their first playoff opponent chose to withdraw from the tournament, so the Eagle team advanced directly to the semi-finals. A comfortable 255-65 victory over the A team from Madison High School put them into the championship match against the D team from host school San Antonio Reagan. It was a tight match throughout, and at the end of regulation the scored was tied at 155. Play was extended to a sudden death tossup question to decide the match. Fortunately for the Eagles, one of the Reagan players believed the National Air and Space Museum is in New York City. His incorrect answer and NEG5 gave the Savio JV team the win, 155-150! Matthew Meskill led the team and the entire JV field with 84.44 points per game (13 powers and 9 NEG5's). 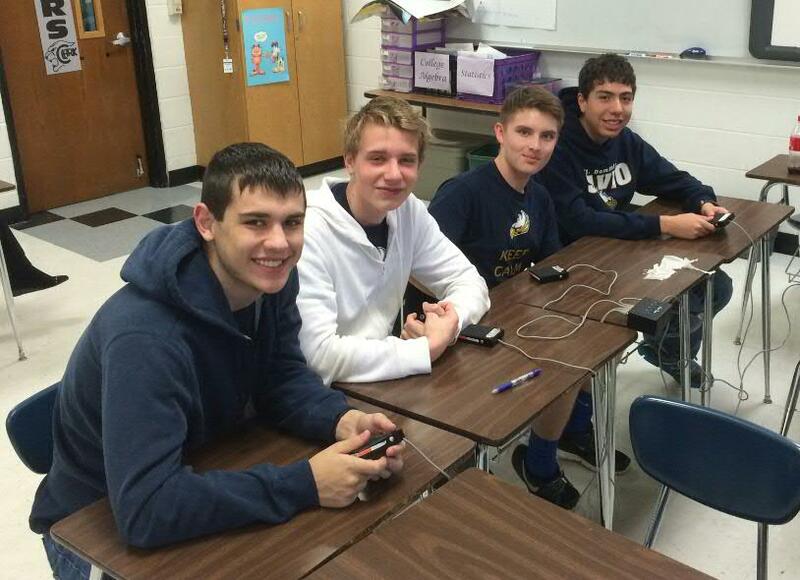 Eleazar Camez, Jack Frey, Nick Isakson and Daniel Jilek competed in the tournament's varsity division. Their day started off much like the JV team's with wins over John Jay High School and Reagan B by an average score of 405-50. But reality sunk in against Reagan's A team which is currently ranked #38 in the country. The Eagles lost to them by a score of 465-155. They recovered with a 425-160 win over Reagan's C team, and then faced a familiar foe, Brandeis A. When the Eagles faced Brandeis in January it was a nail-biter with the Eagles hanging on to win by 5 points. This time the Brandeis team shot themselves in the foot with a flurry of NEG5's early in the match. Before reaching toss-up number seven Savio was out to a 110 to -10 lead. But Brandeis' aggressive style paid off as they stormed back to take the lead by tossup number 17. But just prior to the final toss-up the score was tied at 225. Just like the JV squad's championship win, a NEG5 by the opponent on the final question sealed a victory for the varsity team 225-220. Unfortunately the Eagles' celebration of this emotional win was short-lived, and a letdown in focus led them to lose their final prelim match to Harmony of North Austin. With a 4-2 record the Savio varsity squad claimed the number four seed for the playoffs. They were able to avenge their preliminary round loss by defeating Harmony in the quarter-finals by a score of 285-160. But their reward for advancing to the semi-finals was a re-match with Reagan A. The top squad from the host school was not to be denied, and they bounced the Eagles from the tournament in convincing fashion 585-60. The Savio varsity ended the day tied for 3rd place. Daniel Jilek led the way for the team with 53.75 points per game (11 powers and 7 NEG5's). Additionally, Daniel was the number three scorer in the whole varsity field. By virtue of the two first place finishes in February tournaments the Eagles have earned an automatic bid into the state championship tournament on April 30th. Had they not earned the automatic bid, however, the Savio team was well-positioned to earn a qualification for total tournament points. As of the end of February the team is number three in the state in the tournament point standings. They trail only LASA (#3 in the USA) and Dallas St. Mark's (#26 in the USA). Additionally, by finishing 3rd in the varsity division of the Gipper Games the team has qualified for the High School National Championship Tournament. It will be held in Dallas on the weekend of May 28-29. The Savio Baseball team traveled to San Antonio this past weekend to play in the San Antonio Independent School District tournament. With 16 teams participating, the Eagles went 3-1, reaching the championship game. Offensively, the Eagles batters hit well producing 20 hits over the weekend with John DiGravio, Tony Aufieri, and Marty Sedlacek each having 3. The Eagles pitching was dominant the first three games allowing only one hit as Savio beat SA Lanier 12-0, SA Roosevelt 5-4, and SA Burbank 1-0. Tanner Martinez pitched a no-hitter against SA Lanier on Thursday, Daniel Zamora gave up one hit against SA Roosevelt on Friday, and Brandon White and Marty Sedlacek combined for the no-hitter Saturday afternoon against SA Burbank. In the championship game Saturday afternoon against SA Southwest, Simon Scales struck out 3 batters but ultimately the Dragons prevailed 9-1. The Eagles' record is now 8-2 for the season. The next game is Monday (2/29) at the Savio field at 3:30 against Meridian. 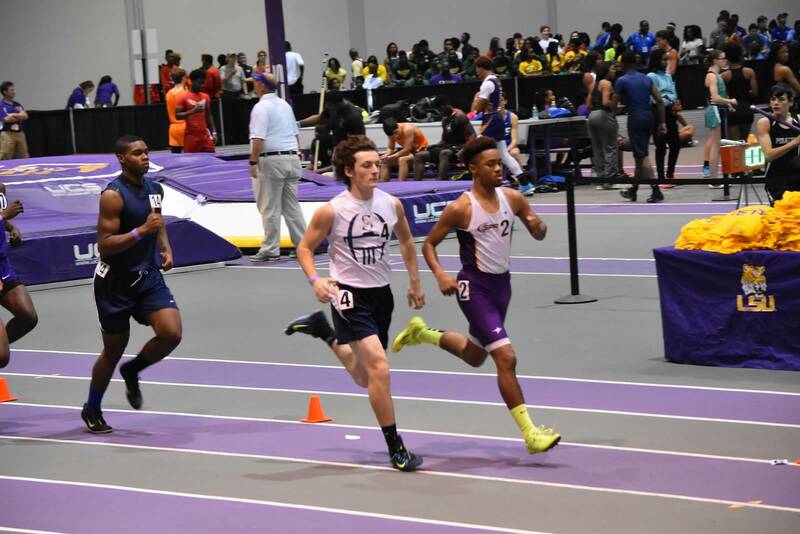 Savio Track traveled to South Dallas last weekend to take on some of the highest-ranked high school teams in the nation. With many team members still in transition from winter sports, Savio sent only 8 core competitors to this elite meet, entered in as many as five races each. "I am very encouraged about the 2016 Savio Track Team. We have everybody returning, except three, from last year. Our enrollment this year is the largest in school history, and that is encouraging in itself. The Track Team's goal for the 2016 Season is to create a fearless attitude about competing and to compete on a high level. Of course we always want to have good sportsmanship and to be considerate and respectful towards opposing scholar-athletes. We believe that we have a team that will compete very well in District, Regionals, and State. We want to develop a team that our school, community, friends, and family will proud of." A very promising track season is begun!! A HUGE congratulations to our Girls Basketball Team for defeating a very talented Tyler Grace Community by a score of 58-53! Led by Stephanie Moses who hit a clutch 3 pointer to come from behind and put us up by 1 with less than a minute left in the game; the rest, as they say, "is history". The Eagle boys playoff run came to an end last night in a hard-fought battle that ended in an overtime loss to Brook Hill. The Eagles got off to a slow start in the first quarter but fought back behind a great team effort, led by Logan Blow, only to have the opponent hit a 3 pointer to tie the score with less than 5 seconds left in the game. The Eagles couldn't hold on in overtime and their season ends as District champs and Area finalists, sporting a distinguished 25-9 record. Logan also became the first Eagle to top 2000 points scored in his distinguished career. Congratulations to Logan and the rest of the Eagles for a great season! 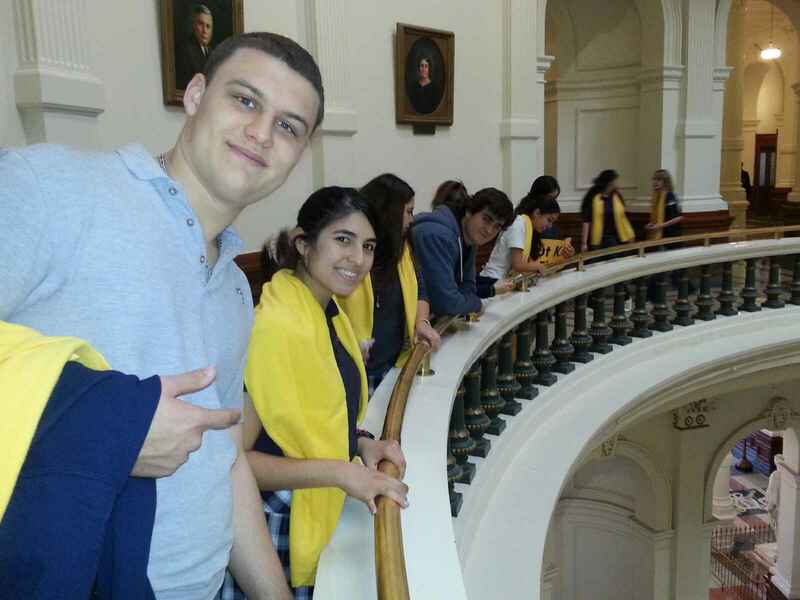 On Saturday, 11 Savio Latin club students participated in the Area Convention, a competition for Latin students throughout the Austin area. Our students placed 1st in 4 of their competitions, received 2 trophies for exceptionally high scores, and the team placed 4th overall in their division. Finally, all 10 students who participated in the Pentathlon contest were recognized for their scores. CONGRATULATIONES, DISCIPULI! The Savio baseball team improved to 5-1 this season, with a 3-1 record in the Texas Private School Classic in the Ft. Worth area this past weekend. The wins came against THESA (4-3), Coram Deo (10-2), and Rosehill Christian (13-3); with the loss against Southwest Christian (2-7). The Eagles’ offense continues to be consistent banging out 35 hits over the four tournament games. Brandon Rodi, Kayne Gonzalez, and Tony Aufieri all had 5 hits; with Marty Sedlacek and Daniel Zamora having 4 hits each. Pitching and defense was also on display. Tanner Martinez, Tony Aufieri, and Marty Sedlacek each picked up a win on the mound and the Savio defense committed only three errors over the four games. The highlight of the weekend was a thrilling come from behind win against THESA as Savio scored three runs in the 7th inning with Daniel Zamora driving in two runs to tie the game and Brandon Rodi knocking in the game winning run. The baseball team will play in the San Antonio Independent School District Tournament next weekend, with the first game scheduled against San Antonio Lanier on Thursday (2/25) at 7:30 pm at the SAISD complex. 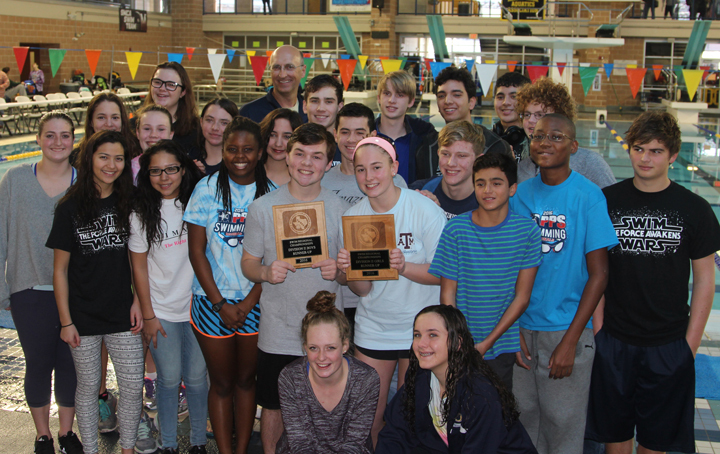 15 Savio swimmers qualified for the State Championship meet Feb. 12 in San Antonio at the same Josh Davis pool in which both the boys and girls placed second at the regional championship just two weeks earlier. The girls and boys teams put in spectacular individual and relay performances with 23 out of 25 events resulting in time drops! The girls placed 5th and the boys placed 7th. Hannah Espinosa took a silver medal in the 100 Breast setting a new school record. Missionary Ennie Hickman Coming to Savio! This Thursday Ennie Hickman is coming to talk with our community about love and relationships in honor of (though just a little late for!) Valentines Day. All are welcome to join us at 9:40am in the gym! 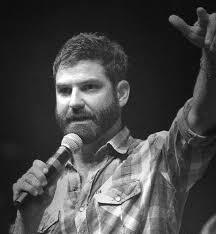 Ennie is a nationally known speaker with an infectious passion for Jesus and we are excited to have him here, you can check out some more about him on his Steubenville Youth Conference profile. Savio Girls Basketball District Champs! The Savio girls basketball team started off the week of February 8th confident and ready for two tough games against the 3rd place team Saint Michael’s and the 2nd place team Regents. On Tuesday, against a well coached St. Michael’s, the Lady Eagles fell short 3 points after coming back from a 10 point deficit. 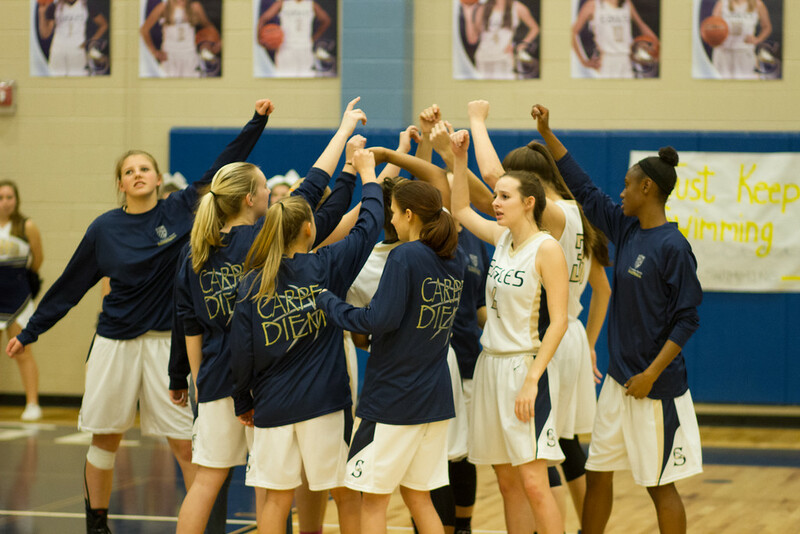 Despite the loss, the girls still had a chance to win district if they won the game on Friday. Led by senior captains Stephanie Moses, Christionna Hawkins, Ashton Bailey, Sarah Greiner and Allison Meskill, the girls responded by having two energetic practices with extreme focus to lead them into Friday’s game against Regents. On Friday night, the girls came out slow and started the game down 2-10. After pressuring Regent’s best player, the girls were able to regain the lead by outscoring Regents 20-10 in the 2nd quarter. Outstanding defensive performances by Christionna Hawkins (6 steals), Angele Kelly, and Stephanie Moses (4 steals) gave the team the energy they needed to come out on top. Stephanie Moses and Angele Kelly also led the team in scoring categories. Stephanie scored 21 points shooting 42% from the 3 point line and Angele went 2-2 from the field and shot 62% from the free throw line. The posts also played important roles with Maddie Miksch securing 8 rebounds, Caleigh Johnson with 6, Angele Kelly with 6, and Victoria Bird with 5. Along with all of the great statistics that helped lead the girls to their district championship, the girls played with great sportsmanship and teamwork. One thing that is great about the Savio Lady Eagles is that they are unselfish and truly care about each other and about what is good for the team. That is something that means more than wins and losses and makes me very proud to be their coach. The girls’ first playoff game will be played as a double-header with the boys basketball team on Tuesday February 23rd at the Savio gym. Please come and show your support for the first time district champions! Savio Baseball celebrated Presidents' Day with a 2-1 victory over Lago Vista on Monday afternoon at Savio’s home field. The Eagles played solid defense committing no errors and allowing only two stolen bases. Simon Scales was the starting pitcher for Savio and threw four shut-out innings, striking out three Vikings. Tanner Martinez pitched the last three innings allowing only one hit. The Vikings held the Eagles to two runs on two hits, one each by Marty Sedlacek and Tony Aufieri. The Junior Varsity team also won on Monday, beating Lago Vista 6-4. The Eagles travel to the Fort Worth area this weekend to participate in the Texas Private School Classic. The schedule includes Nolan Catholic on Thursday at 5:00, Rosehill on Friday at 2:30 and Coram Deo on Friday at 5:00. The Savio Baseball team, coached by Bryan Edwards entering his 2nd year, has been eager to get the 2016 baseball season underway. So, it was no surprise when the Eagles came out swinging on Saturday totaling 11 hits against Katy St. John XXIII Lions, resulting in a 7-1 opening day victory in front of a large crowd at Savio’s Bierschenk field. Savio jumped on the Lions early scoring five runs in the 1st inning highlighted by Senior, Simon Scales’ two-run homer. Junior, Brandon Rodi and Senior, Kayne Gonzalez each smacked triples during the inning. Eight of the starting nine batters for Savio had hits, including two hits each for Juniors, Brandon Rodi, Tony Aufieri, and John DiGravio. Junior, Daniel Zamora, who started on the mound for Savio, and Senior, Marty Sedlacek held the Lions to one run and five hits. The Savio defense also held the Lions to only two stolen bases. The junior varsity game played earlier in the day ended in a Savio loss, 3-6. The Eagles’ next game is Monday, February 15 at Savio field versus Lago Vista High School with the junior varsity taking the field at 11 am followed by varsity at 1 pm. The Savio Baseball team kicked off the 2016 season on Saturday, February 6 as six former players from the classes of 2012-2015 returned to play in the Alumni Game. The former players (shown above from left to right) included Tyler Martinez, Schyler Hallberg, Miguel Serrano, Nick Zamora, Stephen Bierschenk, and Eddie Matthews. The final score was 6-3 with Savio defeating the Alumni team but everyone was a winner especially those who enjoyed a tasty burger or hot dog provided and grilled by the Martinez family. Many thanks to the fans who came out to watch and to the alumni players who returned to play. It was great to see them back on the Savio field! The first official game of the 2016 baseball season is Saturday, February 13 as Savio hosts St. John XXIII. The junior varsity will play at 11 am followed by the varsity at 1 pm. Come out and cheer on our teams!! The Eagles Boys Soccer team won big over Hyde Park 4-0 on Senior Night clenching a spot in the playoffs! We will host the BI-District Playoff game this Saturday, Feb. 13th @6:00 pm at the Town and Country Fields off of Parmer. We need everyone to come out and show your support! Bring a chair! The Savio Girls Soccer team took on Hyde Park Monday night and celebrated Senior Night. Our two seniors, Melanie Shempert and Maria Saenz, were sent off with a 2-0 victory. Not only was it the first time in the history of Savio girls soccer to beat Hyde Park, but they accomplished it with a shut out! The girls played a terrific game and will only come back stronger next year! Eagles Boys Basketball Back to Back District 3-AAAA Champs! The Savio Eagles, winning their 24th game, were energized by a fantastic Savio crowd and rode the electricity to a convincing 54-47 win over state-ranked rival St. Michaels on Tuesday night. The Eagles close out the regular season at Regents Friday. The sub-varsity will be vying for championships as well, with the 9th and JV teams both playing for at least a tie for the crown. So please come early, stay late, be loud and proud...the Eagles fly with no fear!!! 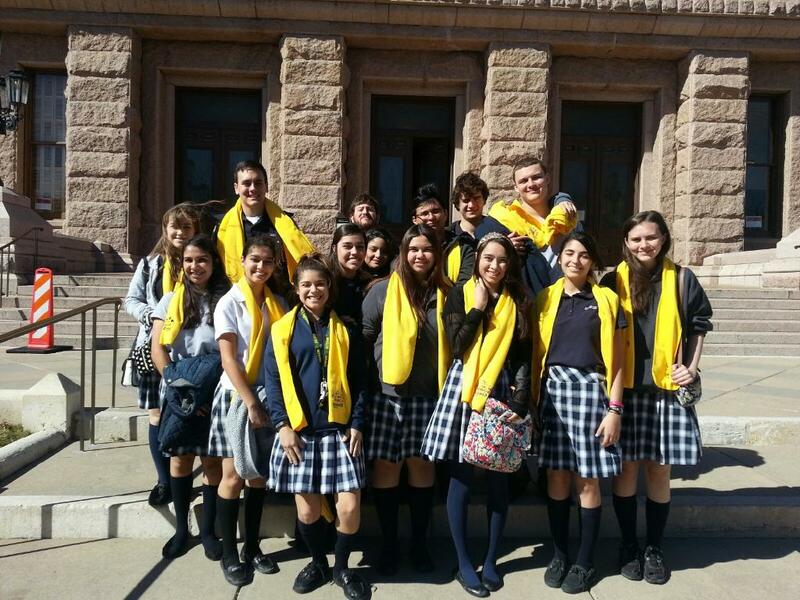 The Savio Speech Team competed Saturday, Feb 6, at the St. Edward's Sorin Speech and Debate Tournament. Amanda Fuentes made it to the semi-finals in Prose Interpretation, Rachel Givens made it to semi-finals in Poetry Interpretation, and Caitlin McCauslin won 3rd place in Impromptu Speaking. The 2016 Savio Baseball Team is hosting an Alumni Game on Saturday, February 6, 2016 @ 11:00am. Please come out and support the 2016 Savio Baseball Team and visit with some familiar former players. The Baseball Program will have concessions available and will be selling grilled hamburgers and hot dogs, with proceeds benefiting the baseball program. Savio Boys Basketball Continue Winning Streak! The Savio Eagles boys basketball team continue their winning ways this week by defeating former district leader Hyde Park last Friday night and taking a hard-fought road victory last night vs. Waco Reicher. These victories clinched the Eagles 3rd consecutive state-playoff spot and leaves the team in sole possession of 1st place. For the Eagles to have the best draw in the playoffs, they must defeat powerful nemesis from the south--St. Michaels--this coming Tuesday in "Senior Night". This is the biggest game of the season and can clinch the Eagle's back-to-back district crown. Savio won the last match 73-72 in three overtimes, so a victory will NOT be easy! So Eagles--come early, be loud and stay late! 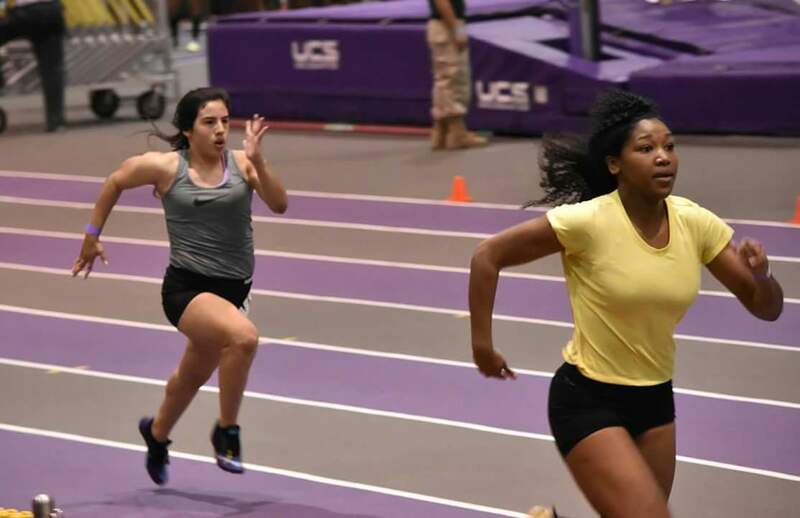 Julian Sparks, Kacie Mayberry, Arriana Islas, and Octavyia Williams, all members of the esteemed Savio Track Team, have been busy training and competing on the indoor track circuit this winter. 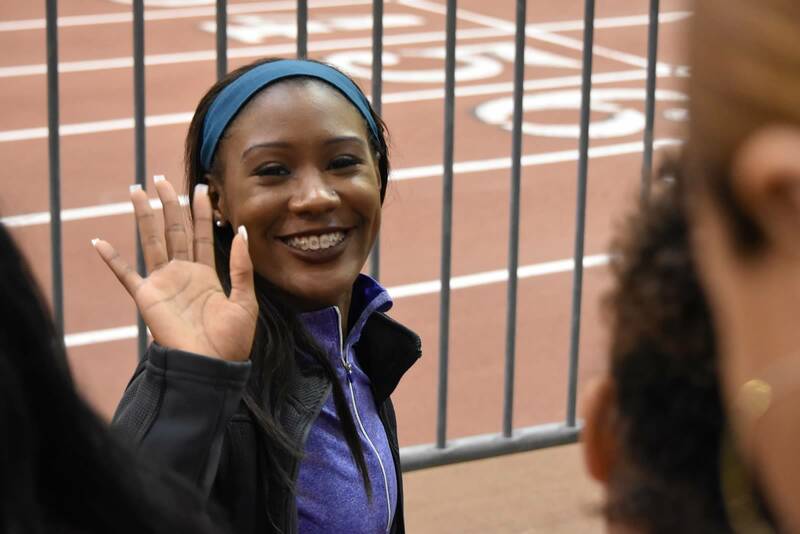 These ladies and gentleman have been traveling to elite-level meets in Texas and beyond to test their abilities against the best athletes in the U.S.. The competition has been fierce but exciting! Athletes who brave the cold-weather training and top-tier competition of indoor season gain much. Not only are they training to get an edge for the coming school season, but they are gaining confidence among a field of very high-level competition. There will be no jitters left after running on the big stages at such enormous meets as the LSU High School Classic and the Carl Lewis Indoor High School Invitational, where the highest ranked athletes in the nation convene to get the attention of university track scouts and coaches. As always, Savio Track Fans can be proud of the poise, sportsmanship and integrity demonstrated by our hard-working athletes! .....and they are really fast, too! Senior, Julian Sparks hunts down a competitor in the young men's 800m dash at LSU. Senior, Kacie Mayberry, pleased with all of her races at the University of Houston. 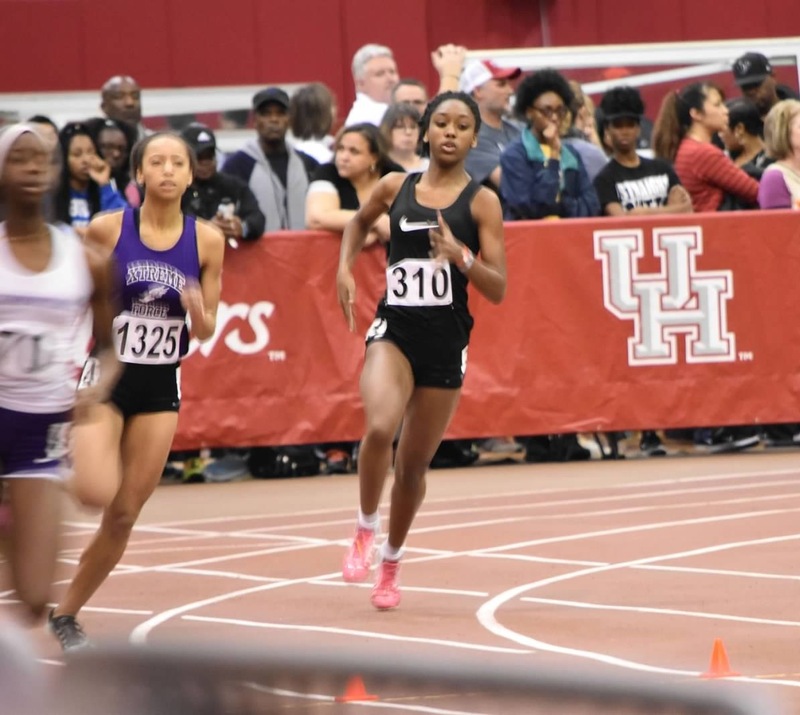 Junior, Octavyia Williams takes the curve of the 400m dash at U of H.
Savio Track Season is coming soon!!!!!! The first tournament of the season for both Optimus and Guardian was held on January 16 at Connally High School. A flurry of building activity during the previous two weeks had resulted in promising yet inconsistent results for both teams, and they both struggled to find their footing during the tournament. Guardian opened with a narrow 1-point loss as they worked all day to complete the critical “robot hang” in the last 30 seconds of the match, which they finally accomplished in their fourth match of the day for a critical win against one of the best teams in the competition. Optimus started out with 3 straight losses (all by less than 20 points) before closing with two big wins and the 2nd and 3rd highest scores of the day! Unfortunately, their game record left Optimus and Guardian in 15th and 17th place (out of 21 teams) after the qualifying rounds, but Guardian was actually selected by the 2nd place alliance captain (Viperbots Venom) to compete in the elimination rounds, as it was recognized that they were one of only 5 teams even capable of accomplishing the difficult and high-scoring “robot hang.” Their 3-team alliance started strong, winning their semifinal match against the #3 alliance 2-0, but after a close loss in their opening finals match, they were closed out by the strong #1 alliance, consisting of St. Gabriel’s SaberBots, Vandegrift’s Viperbots Ourobouros, and Connally’s Dark Horse. Although Guardian made it to the Finals, the small number of advancement spots meant that both Guardian and Optimus needed to be one of the three finalists for the tournament’s top honor, the Inspire Award, in order to advance. Guardian came very close, as they won the Innovate Award for the second year in a row and were the runner-up for the PTC Design Award – but they fell just short of advancing. So last Saturday’s large “Double Qualifier” tournament at Vandegrift High School became a “do or die” moment for both teams, their final chance to advance to the Regional Tournament. A double qualifier is essentially two tournaments being held on the same day, so Optimus and Prime were split into one division (“Everest”), and Guardian and Silverbolt into the other (“K2”). The two weeks between tournaments were filled with frenetic activity by all teams – Prime worked on stabilizing their design and programming, Guardian worked to debug some mechanical problems that limited their consistency, Optimus created a secondary mechanism to help them climb and hang successfully, and Silverbolt was in the middle of a redesign to improve their scoring ability. Both Prime and Guardian started out strong, posting 4-1 records to finish in the top four after qualifying rounds. Optimus also jumped out with two wins in their opening matches, but struggled to consistently score as they lost their final 3 matches. Silverbolt had a lot of fun while they worked hard to debug some of their brand-new mechanisms - some of which had only been installed the previous night! – before falling to a 1-4 record. As the 3rd-ranked team in the Everest Division, Prime recognized that their sister team Optimus was extremely close to “putting it all together” in their matches, so they chose them as their alliance partner, transforming into “Optimus Prime” to fight for the championship. In the K2 division, 4th-ranked Guardian received an invitation to form an alliance with some old friends, the #1-ranked team “Disgruntled Robots,” which they happily accepted. Prime’s bet on Optimus proved right, as Optimus finally succeeded in hanging their robot! Along with Prime, this powerful “double hanging” move was enough to sweep them into the finals 2-0 against the #2 alliance, while setting the 3rd highest score of the tournament! Celebration began immediately, as we knew that their finalist finish guaranteed that Optimus would advance. Unfortunately, in the finals, Optimus/Prime was unable to match the scores from their semifinals, and they fell in two straight games to the strong #1 alliance, led by Viperbots QuadX. In the K2 division, Guardian’s alliance split their first two semifinal matches before losing the rubber match by a mere 6 points: 104-98. While their overall tournament performance was impressive, their fate would now fall to the judges – like Prime and Silverbolt before them, they would have to be one of the top finalists for the Inspire Award in order to advance. And with that, the Iron Eagles became the only program in the Region (with two or more teams) to advance 100% of their program to the Regional Tournament thus far this season! This also marks the 7th straight season that the Iron Eagles have advanced all teams to the Regional Tournament – a terrific record of accomplishment! Next step for the Iron Eagles – all four teams will again be scrambling to update and improve their designs for the challenging Regional Tournament, to be held in San Antonio on Feb. 20-21. Good luck Iron Eagles, and hang in there! Savio sent two squads from the Quiz Bowl team to Tom Clark High School in San Antonio for the Cougar Clash on Saturday, January 30th. Eleazar Camez, Nick Isakson, Daniel Jilek and Patrick Lahey competed in the Varsity Division as Savio "A". 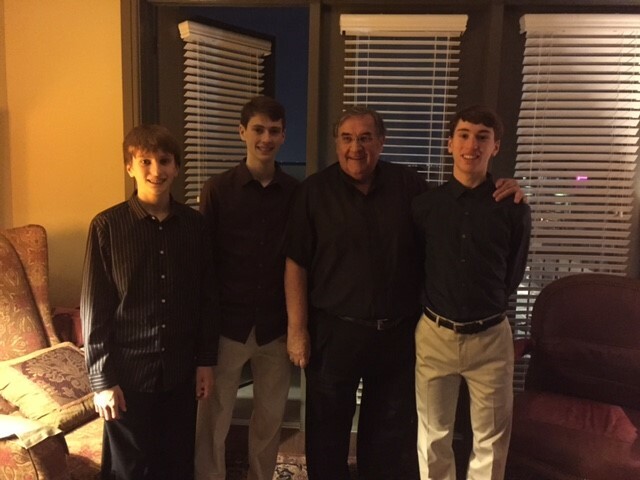 Jack Frey, Nicholas Huth and Matthew Meskill competed in the JV Division as Savio "B". It was an odd tournament in both divisions, as it seemed that just about any team could beat any other team on this day. The "B" team won three of their preliminary matches in convincing fashion. But they struggled in two others, barely holding on for a 115-110 win over the Clark JV team. Their only preliminary round loss was at the hands of the Brandeis JV by a score of 290-140. The Eagles claimed the number two seed for the playoff round, and were surprised that Brandeis, the team who beat them convincingly in the prelims, came in at number three. The top seed went to the JV team from Madison High School who the Eagles had beaten 245-135.
round. The Eagle JV team finished tied for third place on the day. Matthew Meskill led the scoring with 51.25 points per game (4 powers and 10 NEG5's). In the Varsity Division the Savio A team also won three of their preliminary matches by wide margins.The average score in these matches was 279-139. But they dropped one to LASA B by a score of 460-155, and their other two matches were very close. 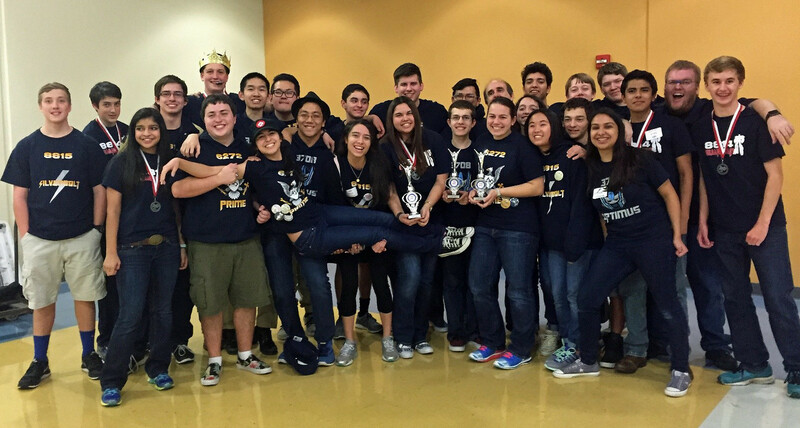 They fell to Cy-Fair High School 280-270, and held off a furious rally by the Brandeis Varsity to win 265-260. Thus, the Eagles finished 4-2 in the prelims, but they could have just as easily finished 5-1 or 3-3. Their record was good enough to give them the number five seed (out of 16 teams) for the playoffs. After relaxing thru a first round bye in the playoffs, the Savio A squad faced number twelve seeded Lamar IB "A". The Eagles were in control from the start, though a late charge by Lamar to put the final score at 260-215 made the match seem closer than it was. In the quarter-finals the Eagles faced the number four seed Clark "A". The Clark team grabbed an early lead and all looked lost as Savio trailed 180-35 going into toss-up number nine. But a mini-rally by the Eagles closed the gap to 180-135 going into tossup number thirteen. Clark bounced back to go up 255-130 just prior to tossup number fifteen. Again the Savio A squad put on a rally and closed the gap to 255-210 going into tossup number eighteen. But the Eagles got no closer as Clark finished them off by a score of 335-255. The Eagle "A" team finished the day in a tie for fifth place. Daniel Jilek led the team in scoring with 41.88 points per game (12 powers and 9 NEG5's). The Brandeis Varsity squad that the Eagles had narrowly defeated in the prelims was seeded ninth for the playoffs. But they put on a magical run, defeating the number one seeded Keystone A in the quarter-finals. They followed this up with a victory in the semi-finals over the Clark team that eliminated Savio. Brandeis capped off their playoff miracle with a victory in the final round over nationally ranked LASA B. It was truly a day on which it seemed any team could have won. tournament in San Antonio will be their last chance to earn a bid in the national tournament. Over the Christmas Holidays, the Boys and Girls St. Dominic Savio Basketball teams continued to grow as Servant Leaders as they assembled Christmas gift baskets for a group of retired priests living at the John Paul II Retirement Community. They delivered their gifts to the John Paul II community riding the Eagle bus on the way to their annual Christmas team party. The St. Dominic Savio Basketball program will continue this annual tradition of serving others and hopes to expand the program to include furnishings for the newly renovated John Paul II Community Center. "What do we want? School choice! When do we want it? Now!" 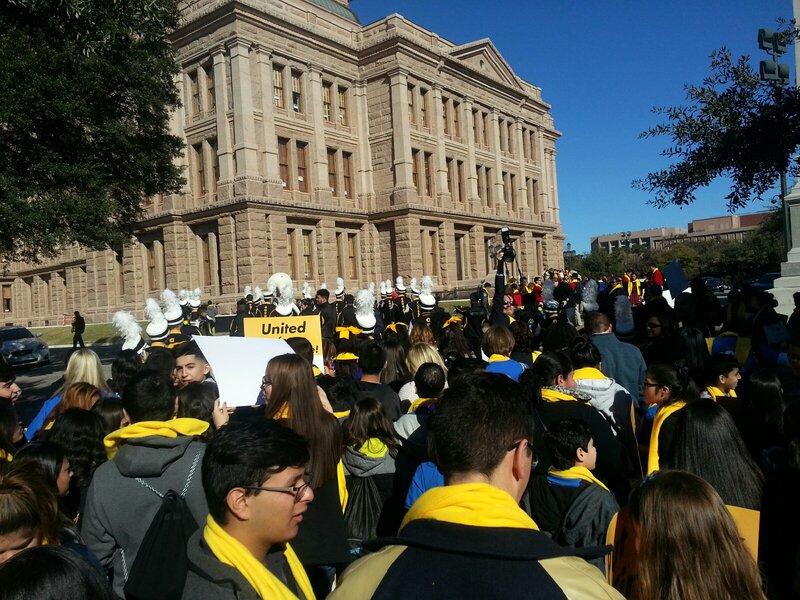 This was the refrain on this sun-kissed Friday morning for several Seniors, who - along with Mr. Daniels and Mr. Jameson - joined around 3,000 other teachers, students, and parents from around the state at the south end of the Capitol building. 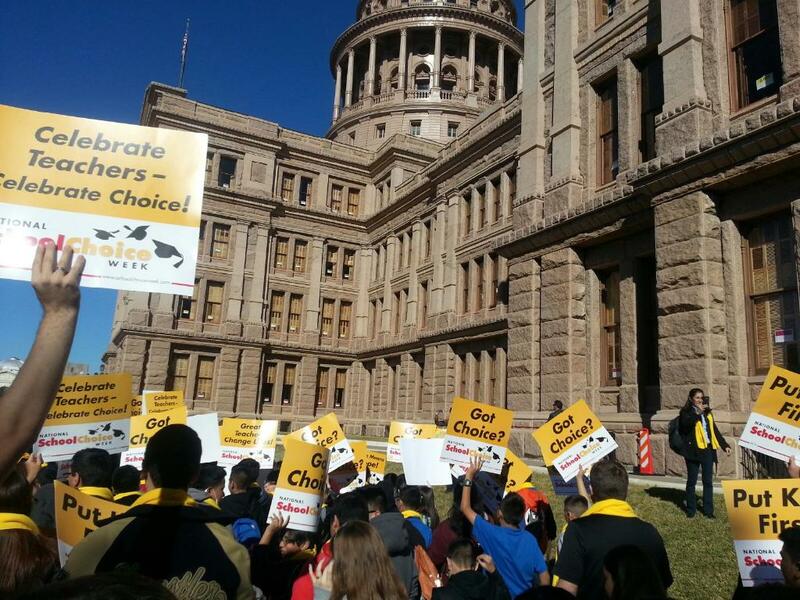 Together with many involved sponsors and interest groups, the crowds were gathered in support of "school choice" measures they hope to see adopted by Texas' 85th legislature, which is scheduled to reconvene in January of 2017. 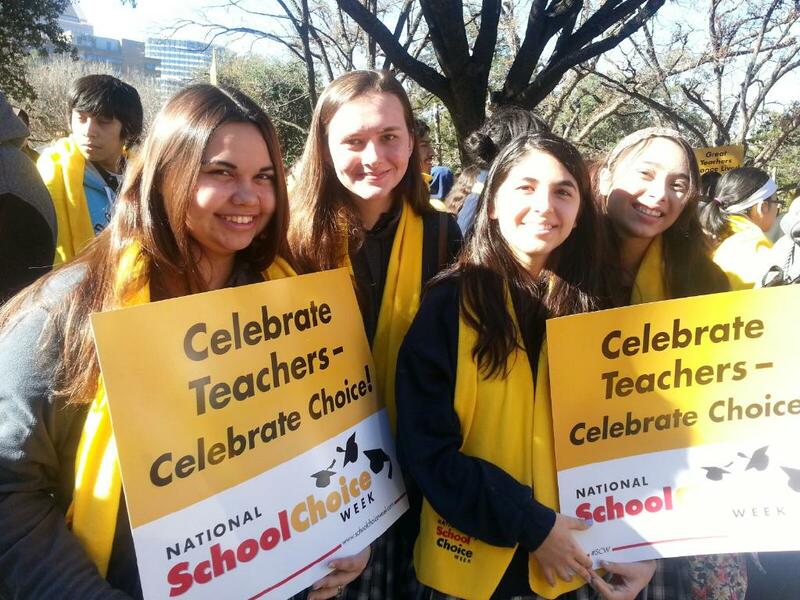 The proposed legislation would prospectively allow a greater freedom of choice, along with financial support in the form of tax credits, to parents facing one of their most crucial life decisions: where to send their children to school. We are proud of our Savio students, especially for their wish to participate as active citizens in the advancement of a noble cause. Despite having to overcome injuries, illness, practicing only 3/5ths as much as other teams, vacation time (taken from practice by some swimmers), and having our first overnight road trip in 4 years, the St. Dominic Savio Swim Team pulled together and performed remarkably well with both the Girls and Boys placing second in the Regional Championship meet on Jan 27. That is the highest placing in the 4 year history of the team. At the meet, divisions 1,2 and 3 all swam together. So there were 27 teams that scored for women and 26 teams for the Men. If you look at the meet mobile results Savio men are ranked 3rd and Women 4th out of all 3 divisions! That means two division 2 teams are in the top 4 teams of division 1! Division 2 Region Results. The number in (parenthesis) is the place. Top 8 finishes score points and letter. The top (3) finishers in bold automatically qualify for State. 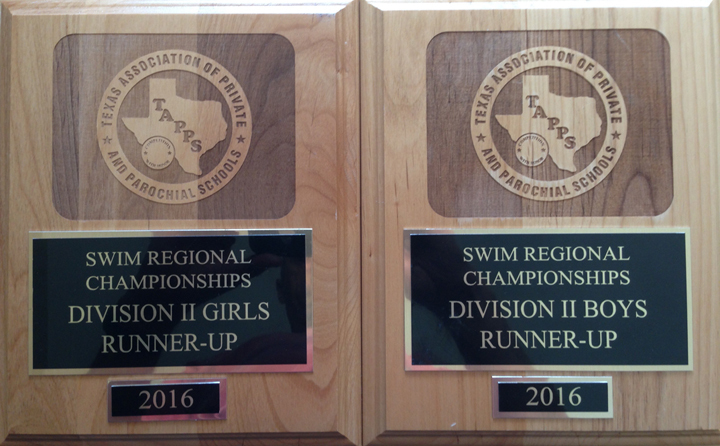 Coach Chris contends that of the 3 regions in TAPPS, region 2 is the most challenging and doing well here bodes well for State. Note: At State each division has their own swim meet. Division 3 swims Friday morning. Division 2 swims Friday afternoon and Division 1 swims Saturday morning.